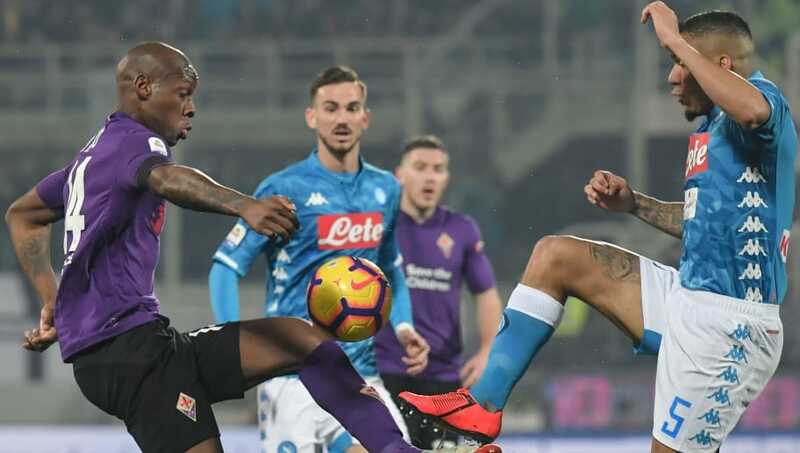 ​Fiorentina managed to hold second place Napoli to a draw on a cold night in Florence on Saturday as neither side could claim the win they both needed. Early efforts from Lorenzo Insigne and Dries Mertens for Napoli didn't lead to a goal, while Alex Meret kept out some strong attempts from Fiorentina in the first half. Both teams had plenty of attempts on goal in the second half as well, but the defences and keepers managed to keep all the efforts at bay. The strong form of the partnership between Federico Chiesa and Luis Muriel continued on Saturday, as both players linked up well and gave Napoli some scares. Muriel's creativity and Chiesa's speed work together wonderfully, but they couldn't get that final reward for their efforts. Whether it was bad luck or some poor help from the midfield behind them, the partnership couldn't manage to find the back of the net and their chances were often snubbed out by a strong Napoli defence led by Kalidou Koulibaly. Starting XI: Lafont (8); Ceccherini (6), Pezzella (7), Hancko (5); Biraghi (6), Fernandes (5), Veretout (9), Dabo (3); Chiesa (8), Gerson (5), Muriel (7). Substitutes: Hugo (5), Mirallas (5), Simeone (5). STAR MAN - Veretout had a wonderful game, both in offensively and defensively. Keeping up with a midfielder as strong as Allan is no easy task, yet Veretout seemed to manage it with ease as he made great interceptions on many occasions and also kept possession under control for La Viola. WORST PLAYER - Bryan Dabo had a poor night, consistently misplacing passes. An early yellow card for dissent was also obviously deserved after consistent protests to the referee. Some poor balls towards the front three often led to nothing and visibly frustrated Chiesa. Whilst Napoli looked strong defensively, their offensive play still left something to be desired. Despite some good shots from both Mertens and Insigne, nobody troubled Lafont frequently enough to create a real chance of winning the game. Arkadiusz Milik's introduction did increase the prospect of a goal after a poor night from Mertens, but a late miss ultimately summed up Napoli's game tonight. Callejón's lack of confidence was also noticeable, often choosing to pass instead of shooting and generally not looking like the player he was last season under Maurizio Sarri. Starting XI: Meret (7); Hysaj (5), Maksimovic (6), Koulibaly (7), Rui (N/A); Callejón (5), Allan (9), Ruiz (4), Zielinski (7); Insigne (8), Mertens (5). Substitutes: Ghoulam (6), Milik (6), Verdi (5). STAR MAN - This game was the perfect example of why Napoli won't consider low offers for star midfielder Allan. He controlled possession in midfield throughout the game and both his offensive and defensive work rate kept Napoli in the game at times. WORST PLAYER - Maybe it's due to his limited playing time because of Marek Hamsik, but Fabian Ruiz had a forgettable night. A few dives, a few fouls and generally invisible for periods of the game meant Allan had to work doubly as hard to keep the centre of Napoli's midfield under check. Maybe with some more game time he will start to gain confidence and experience to link up well with Allan. Napoli really needed to win this game if they were going to and challenge Juventus in this year's title race, but dropping points means it would take a miracle for Carlo Ancelotti and his men to catch up now. Instead they could focus on attempting to win the Europa League, with their next game against Zurich. With Fiorentina's next game against SPAL, Pioli cannot afford more dropped points if Fiorentina want to finish in the top six.